Members of the University of Nebraska–Lincoln Range Management Club recently competed at the Society for Range Management international meeting, placing in the top 10 and scoring the highest of the Great Plains schools.
" I decided to enroll at UNL, because it was one of the only universities with this major. Since I grew up on a family farm in Nebraska, I wanted a major that integrated some agriculture classes into the degree, and I always have been interested in meteorology and climatology. So, applied climate science was the perfect fit, since the major description is how the climate impacts society as well as agricultural and natural resource systems." 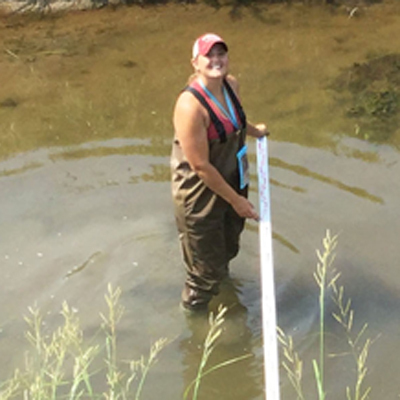 "I believe immersing yourself in a wide range of fields like hydrology, soil science, ecology, gives you so many more learning/career opportunities." "After I graduate, I hope to be working in an environment or position where I can help to improve the environments and ecosystems that wildlife lives in after (the land) has been altered or changed by human activities to help restore it to its natural setting." The fifth-year senior came in to the University of Nebraska-Lincoln as a microbiology major but quickly realized it was not for him. A semester in an intro to soils class changed his mind and career path. He decided he wanted to help save the environment and do it with soil. Now as an environmental restoration science major with minors in water science and biology, Hackbart does just that. "I am a member of the Soil and Water Conservation Society. Through my membership I conducted multiple water chemistry tests with the Nebraska Watershed Network checking for turbidity, nitrate, sulfate and atrazine levels in various bodies of water in Nebraska. I am also a member of the Nebraska Woman’s Leadership Network, empowering woman to be leaders beyond their community and into the world. Additional clubs I’m actively involved in through the university include; Go Green UNL, Horticulture club, Environmental Leaders Program, Sustain UNL, and the Soil and Water Resources Club." 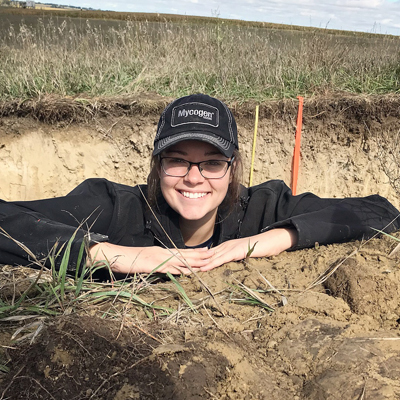 Nicole has been a member of the award winning UNL Soil Judging Team since the Fall of 2017. She enjoys the friendships she has made along the way and the teamwork that combines everyone's skills to be successful out in the field. She hopes to be a soil conservationist for the USDA-NRCS or a Farm Bill Wildlife Biologist for Pheasants Forever. Camden Oathout is a hard worker outside the classroom as well. During her freshman year, she got early experience working in the Water Science Lab on East Campus. She was able to turn that into an internship in the aquarium at Omaha’s Henry Doorly Zoo and Aquarium. 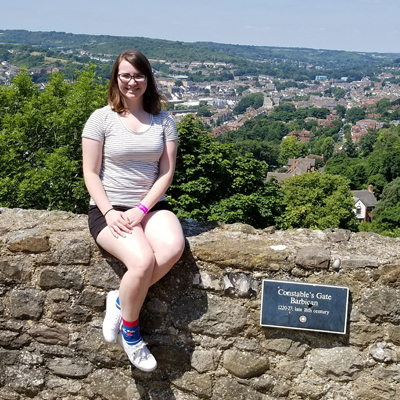 "Diversity and inclusivity here at UNL, and specifically in CASNR, has allowed me to learn about different people, cultures, places, and things that I would never have had the opportunity to encounter had I not been here. CASNR pushes you to step out of your comfort zone and allows people from all walks of life to feel accepted in the school." Alli Carothers has worked with sea turtles in Mexico, cheetahs with the Smithsonian, and done three research projects during her time at University of Nebraska-Lincoln. And she’s just getting started. "People ask me how I get so many opportunities, and I say, ‘I kind of force my way into things’," she said. 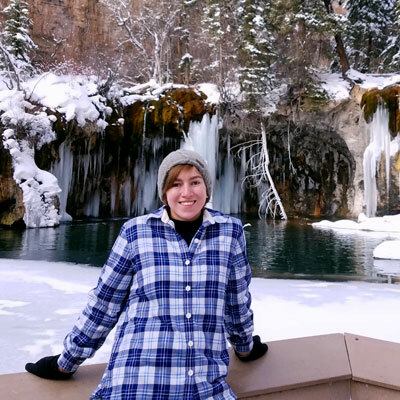 Lauren created a short survey to gauge people's preferences between state parks and recreation areas experiencing extreme drought and those under near-normal conditions. "I think the most rewarding part of my project was getting the survey responses back," she said. "It was heartwarming to see so many people willing to take 10 minutes out of their day to help me do something I am passionate about. I also really enjoyed analyzing the data I had collected." "My favorite class so far has been NRES 233, the wildlife field techniques class. We spent our fall break at Cedar Point Biological Station and spent our time learning different skills that will be useful in our future careers. Some of the activities included telemetry, measuring habitat suitability, scoring deer antlers, setting up trail cameras and setting up different wildlife traps. One of my favorite stories from the trip is when the mouse I caught jumped out of the trap and ran up my sleeve. Aside from the class activities I enjoyed the opportunities to explore the area, especially night hiking with my cabin-mates and viewing all of the stars." " It's been really cool that I get to do a cross collaboration between the two colleges, " Emillee said. Lachenmeier realized she liked the processes that occurred after the big storm more than the actual storm. With hydrology, Lachenmeier uses math to look at water flow amounts and values and runoff from different systems.
" I decided on my major before I decided which university I wanted to attend. I knew I wanted to study water science. I researched and toured several universities, but UNL was the only one that had a major in water science. I competed at State for Science Olympiad for 6 years, which is hosted on UNL’s east campus. Being able to come to a place that was familiar to me made my transition experience all the better. " " I decided to come to UNL because of the degree programs offered through SNR and the wide range of opportunities there were to study abroad. I was able to study in Australia in the spring of 2016 and Water Science has been a great program for me. Also, I’ve been able to live at home for free the past four years. " "Studying abroad was dream came true. When I finished high school, I got a scholarship to the United States, so I started searching for a school. University of Nebraska-Lincoln caught my attention because it has a high rating and my major was available there. Safety was one of my top considerations, and I found Lincoln is a safe place to be, so that makes me more comfortable. Thus, I choose Nebraska without any hesitation, and I am very glad I made that choice because it has been beyond my expectation." "For the past two semesters, I have had the opportunity to work as a sustainability intern for the Lincoln Public Schools district. I work alongside one other intern as well as the sustainability coordinator for the district. With this internship, I have had the chance to work on a wide array of different projects. 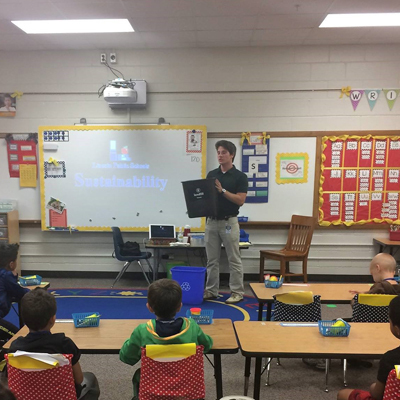 One of the first projects I had when coming on board was teaching kindergarteners about reducing, reusing, and recycling. This was part of their science curriculum and was one of my favorite tasks. " " During my time at UNL, I’ve had opportunities to take part in a variety of internships and research opportunities. One of my most memorable experiences has been my time spent working for the Platte Basin Timelapse Project (PBT). PBT uses various forms of multimedia to document change over time, and tell stories throughout the Platte River Basin. The project has over fifty time-lapse cameras set up across the Basin, in Nebraska, Colorado, and Wyoming. " " My internship for the summer of 2013 was at the Henry Doorly Zoo in Omaha, Nebraska. My goals for the internship included training an animal, which I definitely got to do! I worked closely with lots of animals, and helped train a chicken, goats, and even worked with the North American River Otters! I enjoyed being given the freedom to work with the animals. That was so awesome, to know that the keepers trusted us and let us work with animals they know really well – they didn't make us feel like we were incapable or not responsible enough, and I greatly appreciated that. I also loved that this area was so hands on, and so varied in the number and type of animals I got to work with! Some were less touchable, like the owls and the African painted dogs, but others were handled on a regular basis, and I learned a LOT from that." "Hi, my name is Scott Rupe. During the summer of 2014, I became employed by the U.S. Forest Service as a Wildland Fire Technician. Not only was I being hired to help suppress wildfires in northern Utah, I was also there to educate the youth on the subject of fire. During the course of the summer, I gained a great understanding of fire management through classes, hands on experience, and being engulfed in the fire environment. Overall, this career experience was very worthwhile and something I may continue to do even after I'm done with college. It really helped me find some of my interests and where I would like to end up in the future. I believe that every student should have an experience at least similar to mine. " Each semester, students who have attained high academic achievements may qualify to be on the Dean's List. Each student on this list has earned a semester GPA of at least a 3.70 in a minimum of 12 graded hours.